Toronto This is so weird and bizarre it’s frightening and unsettling, but in the release of a poll yesterday 1 out of every 5 Americans still believe that ACORN is likely to “steal” the midterm elections this coming November! That does represent a decrease from last fall in ACORN’s perceived ability to steal an election. In November we found 26% of people thought the organization had stolen the 2008 Presidential contest for Barack Obama. What’s interesting is that there’s been a significant reduction in concern in Republican ranks about ACORN’s influence. While 52% of Republicans said they thought it had been responsible for Obama’s victory, just 23% of them think it will bail the Democrats out this fall. That 23% of Republicans who think ACORN will be influential this time is actually barely higher than the 20% of Democrats who say they think it will keep their party in charge. 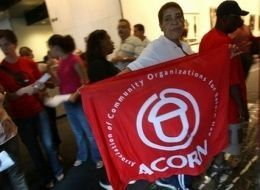 Perhaps Democratic voters have come to the conclusion that ACORN is their last best hope. Or more likely they gave a silly answer to a silly question. And we’re not going to apologize for asking the occasional silly question. Your theories would be much appreciated. New Orleans I don’t have the energy on a Labor Day for the anger, but there’s no escaping the ironies! “…nature doesn’t seem quite as rude as it once did.” What planet is this dude living on in the world of Katrina hurricanes, BP blowouts, Haiti earthquakes, and Pakistan flooding? “We need a holiday that needs no preparation, which is a true holiday indeed.” God knows it shows in this editorial! So much then for dismissing the hundreds of Labor Day picnics and parades around the country that still celebrate the need for working families to have a break, I guess. So much for not even mentioning that union density (membership in unions compared to total workers), has now fallen to 7% in this Great Recession. So much for even looking across the page at Paul Krugman’s warning about the similarities between 1938 and 2010 in the Great Depression and his call for real political leadership and will, and a lot more stimulus. The one thing gotten half-right is how much we all need a holiday from this unrelenting assault on working families! Happy Labor / Labour Day for all those who have earned it, and here’s some small comfort and a shout out to the millions who wish this were a holiday from working rather than another day on the calendar in the desperate search for a job.